Mark Wilson/Getty ImagesFormer Trump campaign manager Paul Manafort leaves the E. Barrett Prettyman U.S. Courthouse after a hearing on May 23, 2018 in Washington, DC. Special counsel Robert Mueller’s team accused Paul Manafort of “foldering,” a technique used by drug cartels and terrorist groups to secretly communicate with witnesses. Manafort, the former chairman of President Donald Trump’s campaign, was sent to jail on Friday to await trial. 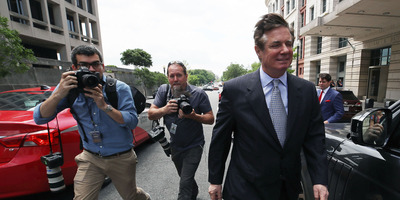 Special counsel Robert Mueller’s team accused Paul Manafort, President Donald Trump’s former campaign chairman, of “foldering,” a technique used by drug cartels and terrorist groups to secretly communicate with witnesses. Manafort has pleaded not guilty to over two dozen charges, including obstruction of justice, tax and bank fraud, and failure to register as a foreign agent.